My wife’s father died last Saturday. It’s been quite a struggle for him. As we laid him to rest beside his wife, the best chicken-leg cooker in America, I couldn’t help but reflect on his life and presence among us. Claude Beavers was born during the height of the Appalachian Coal mining industry. His dad was a coal miner, and he became one too. He was raised on a hill not far from the little coal camp of Amonate, Virginia. His early life was composed of going to school at Beech Fork School, wrestling with his cousins, and hunting and fishing all over the hills and hollers around his home place. He finished eighth grade and began to forge his life as a young man. He was working at a sawmill when he was 19 and married a young lady by the name of Edith Bandy. Soon two children were born and he found work at the mines to support his young family. A third child came along a little later (my wife), and Claude continued working to make his house a home for his little family. They lived at this time on Sinking Waters in the Bandy Community of Tazewell County. A year later after my wife’s birth, Claude had a tragic accident when he went to work. A “Roof Fall” in the mines is one of the many dangers there. He was victim of one about a month after joining the UMWA. A man whose work ethic wasn’t very good, and who missed work many days, happened to be there when the rocks fell on Claude. This man lifted the biggest rock and two other workers lifted the rest. Claude survived but his back was broken and he commenced a long journey through recovery of injury. He was paralyzed from the waist down, and was told he would never walk again. But did I tell you this mountain man named Claude Beavers was from the Appalachian Mountains? You see, there’s something indelibly courageous about true mountaineers. You can tell them, but you can’t tell them much. They’re stubborn. And stubborn isn’t always a bad thing. Claude was sent to Fishersville, Virginia to rehab in a facility there. This was 1968, and the technology wasn’t as good as it is now. After a time, he began to learn to walk with the assistance of canes and braces. His mood wasn’t always good, but in this new life as a disabled coal miner, he refused to give up. Since he couldn’t work at the mines any more, he made sure his family had what they needed. He put out the prettiest gardens anyone has ever seen. A little holler behind where they lived provided the perfect spot, and there, with assistance of those braces and canes, Claude worked and grew corn, beans, squash, cucumbers, potatoes, cabbage, salad peas, and whatever he could grow. He shared these with other members of the family and neighbors as well. His tiny house had a back bedroom for him, especially during painful days when changes in weather would cause him to ache miserably. Other times he stayed in the Living Room watching Westerns and NASCAR, his favorite driver being No 3, Dale Earnhardt. Here he tended the fire in the Warm Morning stove, keeping wood and coal going, and holding court whenever the rare visitor came by. Occasionally, if he wanted to give someone a knife, which was a treasured possession to him, he would make them pay him a penny in return. This tradition is so the knife wouldn’t cut their friendship. I won’t say that Claude was a perfect man or even a pleasant one. There were many days his mood was colored by his pain, and he grumped a great deal. But he was a proud man and he tried to make the best of his situation even though it was difficult, very trying and at times seemed downright impossible. He drove himself without assistance wherever he needed to go. His wife never drove, so it was his job to take his wife and daughter to the Bandy Community Freewill Baptist Church and drop them off and go pick them back up again each Sunday. He also drove to the bank, grocery stores, doctors’ offices, and up the hollers to hunt and fish. The day I proposed to my wife, we went back to her house and asked her mother if we should tell Claude what we had decided. She said she’d go in the back bedroom and check to see what mood he was in. He was sitting there cleaning his shotgun, so she returned and said, “Let’s not do that right now.” We agreed and told him at a later time, during which he pitched a fit, since it meant I would be taking away one of his best helpers. Fortunately for him and us, we were appointed to churches nearby and stayed for six or seven years there after we married. His latest years were tough for him. His wife succumbed to pancreatic cancer in October, 2007. Now he lived alone, and had to begin depending on help outside the family to keep his needs met. He began to develop kidney failure and with it a form of dementia. After several falls and emergency runs to the hospital, he was finally placed in a nursing facility where he spent the remaining two years and about two months of his life. Saturday my wife and I, and her cousin were sitting with him in his room when he drew his last belabored breath in this life. One of his last requests was for my wife to take him “up the mountain.” When men from his family say that, they are referring to something more final than a trip up a hill. Someone sang “Go Rest High on that Mountain” at his funeral services on Tuesday. It was hard to hold back the tears. This entry was posted in Uncategorized and tagged Appalachian, coal miner, disabled, family, father-in-law, fishing, hunting, mountain man, stubborn, stubbornness. Bookmark the permalink. I was once a neighbor of Claude,Edith & family.When you are young you don’t pay enough attention to those who are less fortunate due to injury . Claude was always nice and friendly to us and I know that Tammie and Sandra will miss him. .. He fought every step of the way until he couldn’t anymore. Is in a much better place now and is no longer suffering. He was a strong man and He had a great family behind him. Loved reading this Brad. 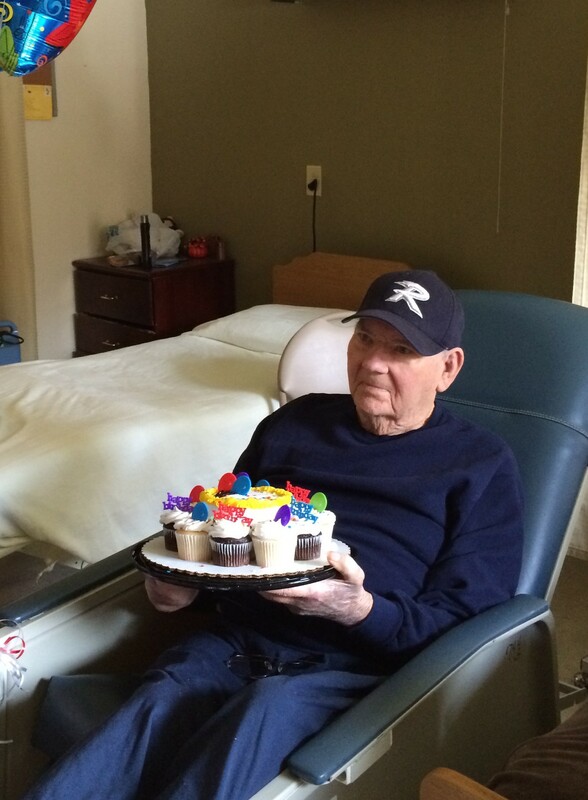 We will all miss Pawpaw tremendously….